Thinking about what is going to come next when you are reading is called predicting. If you read actively and work to predict information, your reading ability will improve. What do you think the secret might be? First think about what you already know about Greece, its islands, its people, its food and lifestyle. Make a list in the table below of at least 6 reasons why you think the people in Ikaria might live longer than other Western Europeans. It could be the fresh air and the friendly, easy-going, open-door lifestyle. It could be fresh vegetables and goat's milk. It could be the mountainous terrain. Everywhere on Ikaria is up, or down, so getting around keeps you fit. It could even be the natural radiation in the granite rocks. But Stamatis Moraitis thinks he knows what it is. "It's the wine," he says, over a mid-morning glass at his kitchen table. "It's pure, nothing added. The wine they make commercially has preservatives. That's no good. But this wine we make ourselves is pure." 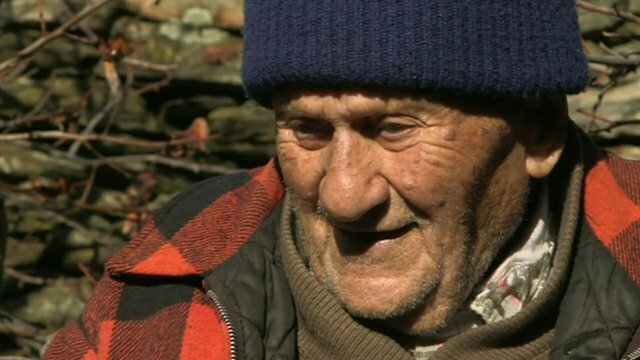 Stamatis celebrated his 98th birthday on New Year's Day. He says he's older, but his documents put his date of birth as 1 January 1915. Outside his whitewashed house are his beloved olive trees, his fruit trees, and his vines. He makes about 700 litres of wine a year, he says. "Do you drink it all yourself?" I ask. "No!" He's shocked at the suggestion. "I drink it with my friends." The wine and convivial days spent with friends and family, helped make Stamatis a poster-boy for the healing effects of Ikaria. Forty-five years ago, living in the US, he was diagnosed with terminal lung cancer and given nine months to live. "At the time it was very expensive to have a funeral there," he remembers. "So I said to my wife 'I'm going home to Ikaria to be buried with my parents.'" By now he has a twinkle in his eye, and is in full flow. It's a story he has dined out on many times, and he clearly doesn't tire of telling it. "I found my friends in the village where I was born, and we started drinking. I thought, at least I'll die happy." "Every day we got together, we drank wine, and I waited. Time passed by and I felt stronger. Nine months came - I felt good. Eleven months came - I felt better. And now, 45 years later, I'm still here!" "A few years ago I went back to the US and tried to find my doctors. But I couldn't find them. They were all dead." Ikaria got its name from the Greek myth of Icarus who, legend has it, plunged into the sea close to the island when his wax and feather wings melted. For centuries it was known as a health destination because of natural hot springs on the island. More recently it has been identified as one of a small number of so-called "blue zones" by the author Dan Buettner and National Geographic, where residents enjoy great longevity. Other places include Okinawa in Japan, Sardinia in Italy, and Loma Linda in California. 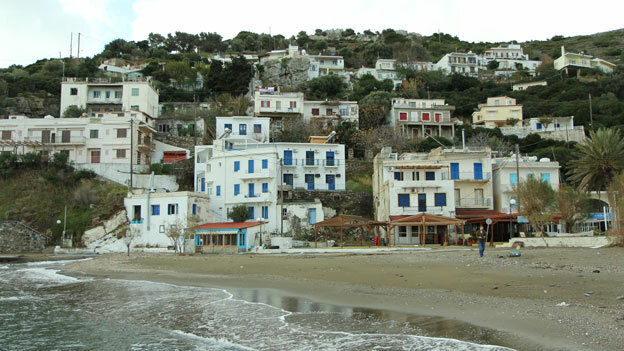 The most comprehensive work on Ikaria has been done by the University of Athens, whose researchers studied islanders aged over 65. On average, the 8,000 residents live 10 years longer than most Europeans and in much better health to the end. There are many significant factors about the islanders' lifestyle which might contribute to their longevity. Even compared to a typical Mediterranean diet, Ikarians eat a lot of fish and vegetables, and relatively low levels of meat. Six out of 10 of people aged over 90 are still physically active, compared with about 20% elsewhere. Most food is cooked in olive oil. Large quantities of wild greens and herbs are gathered from the hillsides for both food and medicinal purposes. Many older people make a daily brew of mountain tea from dried herbs such as sage, thyme, mint, and chamomile, and sweeten it with honey from local bees. "It cures everything," claims Stamatis. Many of the wild herbs are used by people all over the world as traditional remedies. They are rich in antioxidants and also contain diuretics which can lower blood pressure. The researchers believe other elements of lifestyle are also significant. Rates of smoking are relatively low, mid-day naps are the norm, the pace of life is slow and people socialise frequently with friends and family, drinking moderate amounts of wine. Extended families give older people an important role in society. Levels of depression and dementia are low. Dr Christina Chrysohoou, a cardiologist from the University of Athens who has studied the islanders, says they suffer the same sorts of diseases like cancer and cardiovascular problems as others elsewhere, but later in life. "Ikaria gives us an opportunity to study why these people enjoy these beneficial effects. We can't avoid these diseases, but they manage to preserve the quality of their life for many years. The mean age for cardiovascular disease is about 55 to 60. In Ikaria it comes about 10 years later." Future lines of enquiry for the university include geological studies into whether naturally occurring radioactive elements such as radium could have an effect on cancers. There is also genetic research which compares islanders with Ikarians who have emigrated and therefore live a different lifestyle. Meeting some of the oldest islanders makes you appreciate their span of time. The dining table is laden with delicious Ikarian delicacies. "It's just a little snack," insists Voula, wife of 102-year-old George Kassiotis, as he pulled out his identity card showing his date of birth in 1910 and talked about his early life. On his sideboard are photos of him in the Greek cavalry in 1931. He fought the Italians in Albania during World War II and later helped build the first metalled road on the island before retiring in 1970. "I don't eat processed food, I don't smoke and I don't get stressed," says George Kassiotis. "I'm not worried about death. We know that we all are going to go there." The younger generation seem to be keeping traditions going. We ate another meal at the home of Nikos Karoutsos, a hotel owner in his 50s, and witnessed the sight of many friends and family, popping in for a drink and something to eat. "We don't have nightclubs or discos," he says, as people chinked glasses filled with red wine poured from large plastic flagons. "The door is always open, there's no need to call and ask to come." Meanwhile, the teenage children drifted between the table and the computer in the corner to chat on Facebook. Back at the home of 98-year-old Stamatis Moraitis, we left him up a ladder picking olives from one of his trees. "I'm happy I can still do it," he says with a laugh. "I feel so much healthier up here." Which of the following statements about the secrets of living a long life in Ikaria are true and which are false?